I am in need of clear and close up.pictures of the firewall, inner fenders and general engine compartment of a '49 pick-up . I'm in the process of completing a restoration(started by unknown restoration shop) of this truck and need details pictures of a correct engine bay. Any assistance would be very much appreciated. If possible I would like images that could be sent to my email please. I'm also looking for confirmation of a body/serial number as there are no Vin tags remaining. I was told that the seat riser was a location I could find a VIN. There are no such numbers in that location. Any clue as to.where to find other evidence of serial numbers at all????.. thanks in advance! Welcome to the SDC Forum! I suggest starting with Fred Fox's Feature Article in "Turning Wheels" covering these pickups. That article will include factory pictures. At that time there was no true VIN. Either the Serial Number or the engine number, depending on state, was used for identification. Many states have a mechanism to register a vehicle with a lost serial/VIN plate, but it differs from state to state. Sometimes a police inspection and/or the posting of a bond is required. This truck is already registered and that is not of concern. My doing a correct finish of the restoration work is my only real issue. I want it to be a correct as possible. That is the only reason for my wanting a serial number confirmation. Thank you for the replies and look forward to continued assistance, if necessary, from this great group!! Hey Steve...I'd like to welcome you to our forum too! I live just a few miles downhill from you into South Carolina (Greenville County north of Greer). While I certainly do not claim to be an authority on every detail of every year truck, I have a couple of '55 C-cab trucks. One is a parts truck and the one in my signature pic I have owned for about 45 years. I'd love to come up and have a look at your truck at your convenience (and when I can find the time). We have another member (Ron Dame) who also lives in your town and is active here on the forum. In addition to an Avanti, Ron has a later model Studebaker T-Cab truck (Lark Style Cab) but he has been around Studebakers for many years. He might have some knowledge or resources that could be of value too. As for me...send me a private message and we can exchange phone numbers & email addresses. Always good to find another Studebaker fan in the area. I am in need of clear and close up.pictures of the firewall, inner fenders and general engine compartment of a '49 pick-up . I'm still a little uncertain of what you mean by serial number confirmation. Is this what you're looking for? The first 1949 2R5 model had serial number R5-001. The first 1950 model 2R5 was serial number R5-42501. Anything lower than the latter number would normally be a 1949 model. However, as discussed in the truck history referenced above, Studebaker muddied the water by permitting dealers to register 2R-series trucks as later-year models, even though they were built during the previous year, IF they were sold, new and unused, after specified dates. So a truck with a 1949 serial number could have been registered as a 1950 model, and several such trucks have turned up over the years. 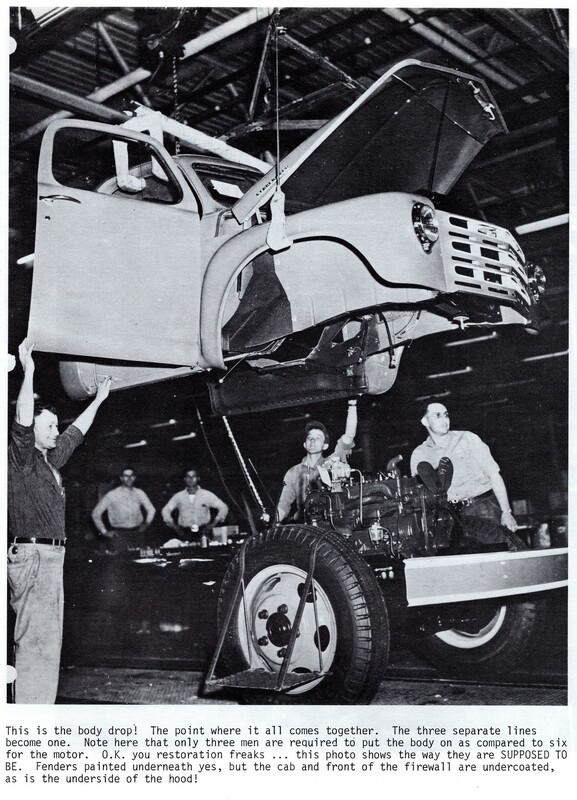 Studebaker did this because there were absolutely no changes made to Stude trucks on the magic 1949/50 model year break ref'ed above. The company did make many running changes (eg, shock absorbers, heater boxes) during the 2R series run, but these were not keyed to model years. They are, however, all accounted for in the truck parts book.